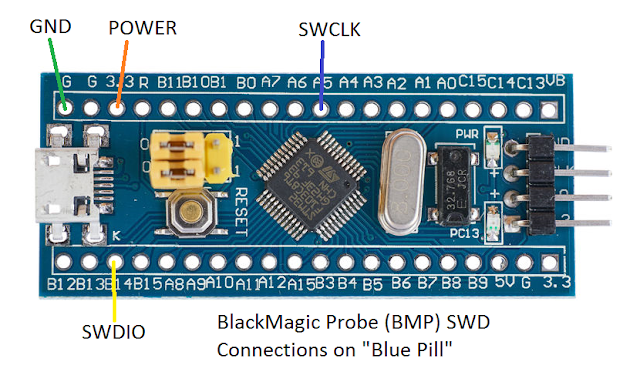 Recently, I learned about the really awesome Black Magic Probe - an interesting JTAG and SWD adapter that essentially has its own, built-in OpenOCD server... so you can use only the GDB client to connect directly to this device for debugging! I've been meaning to place an order for one, but then I ran across this article that converts an STM32F103 "Blue Pill" board to a Black Magic Probe! Edit: I also tried to use the Maple Mini clone, like this one unsuccessfully; Although I was able to flash the bootloader, my computer did not recognized the device when plugged into the mini-USB connector. (apparently I'm not the only one that was unsuccessful with this). The instructions there appear very straightforward, however as soon as I saw the some of the text, I realized the guy was using a slightly different distro of linux. So I'll add my notes on using Ubuntu. My Ubuntu is in a VMWare Workstation Virtual Machine running on Windows 10. If you have a similar setup - just don't forget to connect the device as needed from host in VM - Removable Devices. The WSL Ubuntu on Windows that I have still does not yet recognize all USB devices. 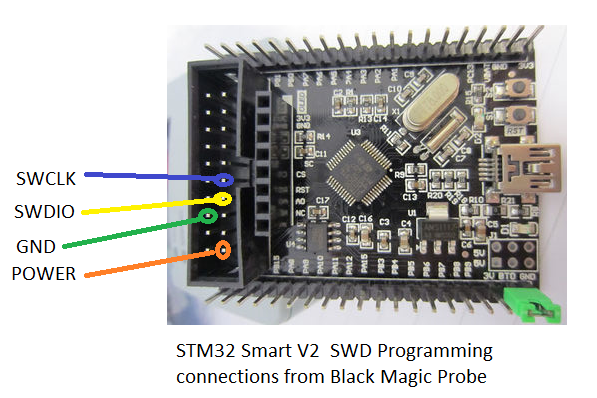 Another significant issue for me turned out to the fact that the STM32F103C8T6 is (debatable: see my comment here and noted by someone else here) only a 64K device (8K for bootloader leaving 56K for app)... and the Black Magic Probe now compiles to 57K. If it was easy, it would be no fun, eh? Ready to flash! However - note that this is where my instructions are different. I had 2 new devices: /dev/serial and /dev/ttyUSB0 when plugged in. Disconnect everything and use the USB to connect. A word of caution here: if you happen to use different sources of power, beware of ground loops. I highly recommend only 1 source of power (either the USB TTY/UART or onboard Micro USB. This could be particularly important if they are on different physical computers, using a USB hub, etc. Bus 002 Device 025: ID 1d50:6017 OpenMoko, Inc.
(don't forget the trailing colon ":"! Found DFU: [1d50:6017] ver=0100, devnum=27, cfg=1, intf=0, alt=0, name="@Internal Flash /0x08000000/8*001Ka,056*001Kg", serial="76543210"
DfuSe interface name: "Internal Flash   "
I should point out that several times I received a verify error at this last verify step (I was really convinced I had a 64K-only device). After trying again the next day - things started working immediately and I never again saw the verify error, even after doing a full erase and starting over. YMMV. Keep in mind that the fact that we are using 128K on a 64K device is rather dangerous. In all likelihood, the manufacturer does an exhaustive memory test: throws away the ones with an error in the first 64K, market the ones with an error in the second 64K as only a 64K STM32f103C8T6 device, and label the ones with no error as 128K STM32f103CBT6 devices. Although this may be a fun Saturday afternoon project, if you are serious about actually using and depending on a BlackMagic probe for real debugging, consider buying one. (besides, always good to support the developer). When you are elbows-deep in debugging your own project, you really don't want a questionable debugger. So at this point, I'm not even sure the dfu bootloader is needed, if we are loading the blackmagic.bin file this way. My particular debugging experiment uses the STM Smart V2 board as a target, and using my STM32 to ST7735 TFT LCD display example with the source on github. This is somewhat of a convoluted setup, as the project is in Visual Studio 2017 (on Windows 10) with the VisualGDB Extension from Sysprogs. then open the solution Z:\home\gojimmypi\workspace\STM32-ST7735\STM32-ST7735.sln in Visual Studio and compile. then in GDB, connect with the first ttyACM[n] device (the second one is a serial port). Mine were originally ttyACM0 and ttyACM1, but then later changed to ttyACM1 and ttyACM2 (no idea how/why). I even saw an instance while debugging that ttyACM1 changed to ttyACM0 yes leaving me with (ttyACM0 and ttyACM2).Weird.